Wedding card designer program creates invitation cards in different shapes including rectangle, ellipse, rounded rectangle and CD/DVD. Wedding card designer program is developed with wide-variety of inbuilt templates to design personalized invitation cards. Wedding card design software provides advanced printing settings to print created invitation cards. 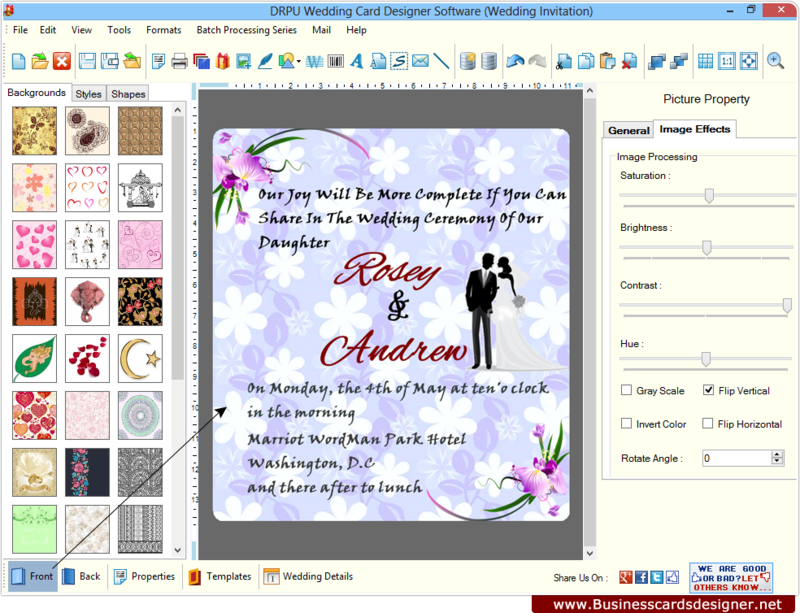 Create personalized invitation card with wedding card designer software. Using wedding card designing program, design beautiful invitation cards to share your happiness with your friends and relatives. Wedding card designer software design invitation cards in various shapes such as rectangle, ellipse, rounded rectangle and CD/DVD shape as per your need. Wedding card designing program design multiple numbers of invitation cards using batch processing option. Software empowers you to send created invitation card at user specified email address by inbuilt email settings. Wedding card design program is developed with predefined templates to design customized invitation cards. Inbuilt designing tools including ClipArts, Text, Pencil, WordaArt, Signature and other designing tools to make wedding card. Developed with advanced printing settings to print designed invitation cards. Provides option to add images, shapes and other objects on card.